Is it snowing in Jay Peak ?Thank you! For 50 years, Jay Peak has been known for its unbelievable terrain, incomparable glades, and abundant natural snowfall. Vermont's only aerial tramway is one of 8 lifts accessing 385 acres of terrain, including 76 trails and, new this season, 4 terrain parks for skiers and riders of all abilities. 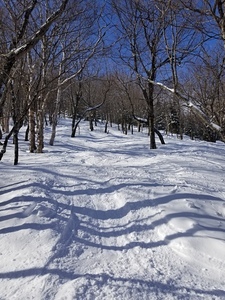 Jay Peak's boundary-to-boundary woods policy makes it a favorite among advanced skiers and riders but the glades aren't for experts only. 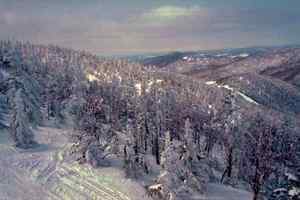 The mountain also has the most beginner and intermediate tree skiing in the East. 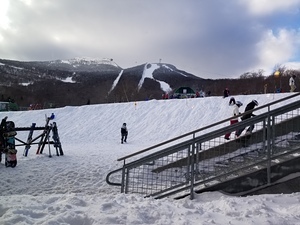 New skiers and riders, be sure to check out The Zone, Jay Peak's learning area, which includes 80 acres of wide, gentle, easy to maneuver trails and introductory glades. Jay Peak's Championship 18 hole golf course was added in 2006. Lets face it, we're not comparing the terrain here to that of the phenomenal ski circuses found in the Austrian Alps, so getting grounded on that thought Jay Peak is one of the best to be skied venues in Eastern N.A.! You get the best chances for fresh here, combined with a reasonable consistent vertical drop and an assortment of runs ( I'd like to highlight the glades, moguls and piste pitch). It is, however, expensive to stay overnight on or off hill but does offer a great indoor waterpark for family; fyi: not pet friendly! They will fine you for it without compromise! Check out the General Store in Jay for a fabulous "Slab" sandwich and whatever else too!